RouteGadgets for both the Prologue and Final events at the Cottam Summer Sprint are now ready, access via this link. The league table showing scores for event 1 is now available here. This is also linked from the series webpage which may be accessed using the picture link on the left side of the home page. The Summer Sprint Series got off to a great start tonight with a return to the Ancient Oak and the compact Cottam urban map. Results are linked from the series web page. The Warrior OC Battleaxe series ended this evening with an event in Mickleden near Great Langdale. After the barbecue, prizes were presented, including two SROC winners. 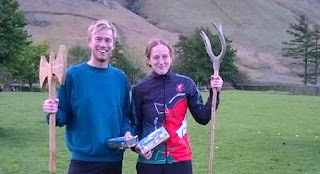 Rebecca Rooke (pictured with male winner Jack Wright) won the Ladies trophy, and Quentin Harding was Male Vets winner. Fans of midweek races now look forward to the SROC Summer Sprints and LOC Summer Series, not to mention the SELOC Summer Street series. No excuses for a lack of exercise over the next few weeks! The popular SROC Summer Sprint Series is about to return for the 2016 season. Check out the series flyer and event description. The first event will be at Cottam on Tuesday 24th May. More details here. These events are aimed at all abilities and are intended to be fun, with a good social aspect as well as plenty of friendly competition. RouteGadget is now available for the Club Picnic. Share your route and see where everyone else went! Beautiful Spring weather served to enhance an enjoyable event at Traitor's Gill today. The picnic itself followed the orienteering, and the sheltered woodland setting was appreciated by all. Results may be viewed here. Runners who claimed to have visited the non-working control have been credited with it. Any other queries please get in touch. Winning SROC team at the British Relays. Rebecca Harding, Heather Roome and Rebecca Rooke (plus Harriet). 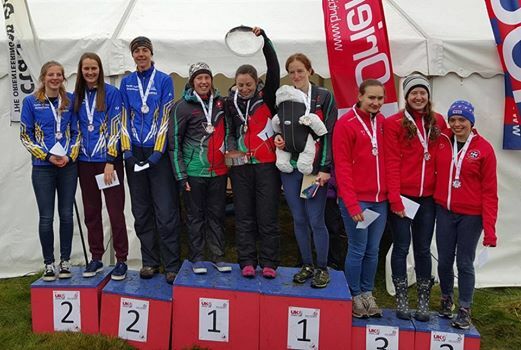 Results are now on-line at http://siresults.co.uk/2016/boc/ Also on the podium were the W50 team of Deb Murrell, Rowena Browne and Jane Anthony who finished in the Silver position. Well done to all who took part. SROC HQ has received a message to say that the Women's Premier team of Heather Roome, Rebecca Harding and Rebecca Rooke has won the trophy! We await official results confirmation, and indeed results from the other relay classes.